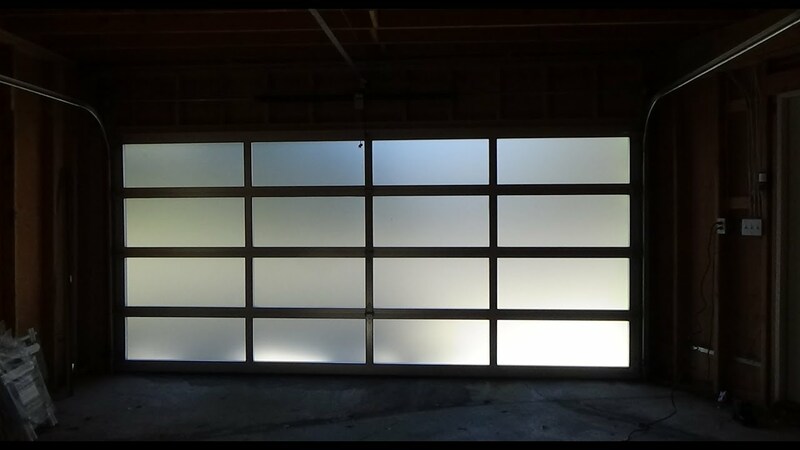 You are here: Home » News » Product News » What are most garage doors made of? 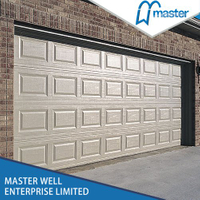 Sectional garage doors are the most common types of garage doors in the world – you probably have one of these on your home as well. 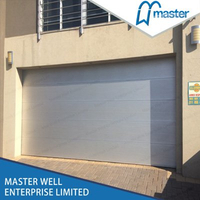 The panel of a sectional garage door is broken into sections (hence the name) which are held together by hinges. The hinges allow the garage door panel to bend which effects how it opens. 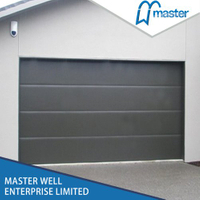 A sectional garage door will move up a vertical track until it reaches the top of your garage door opening. Then it’ll begin to bend and run parallel to the ceiling of your garage along the horizontal track. It is composed of door plate, door opener and fittings. Door panel: A plate-like member that constitutes a door leaf, which functions as a closed opening. 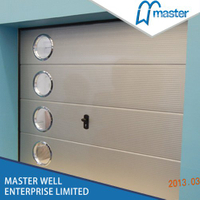 The thickness of the door plate of Master Well is 40/50mm. There are many styles to choose from wood grain with rectangle, wood grain with stripes (3), orange peel only, orange peel with rectangle, orange peel with stripes, flush with rectangle and reinforcing line, fold only. 1. The surface of the fine-grained embossed door body has an irregular powder-sprayed texture, which has a strong embossing effect, which not only increases the strength but also is beautiful and elegant. 2. Adopt high strength double-sided high quality galvanized steel, double-sided spraying long life paint, strong corrosion resistance. 3. The high-quality steel plate wraps the outer end to make the inner and outer sides adhere together to better seal the two walls. 4. 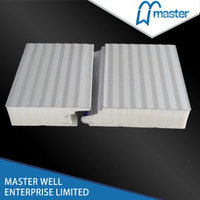 The sandwich layer is a highly solid polyurethane foam, which can increase the thermal insulation effect. 5. There is a "U" type sealing strip at the bottom of the door, which is more cold and windproof. 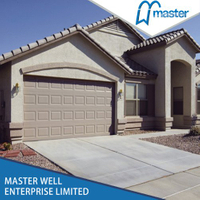 Garage door opener: To achieve the door opening and closing of the power device. 1. Automatic time-delay light: when the garage door is opened or closed, the light will turn off automatically after 2.5-5 minutes. 2. Maintenance-free dc motor, strong power, smooth operation, the lowest voice. 3. Ring transformer, energy saving rate: 70%. 4. Planetary gear switch, hall element sensing, pulse. 5. Program control, convenient operation and complete functions. 6. The configuration of resistance rebound function, people or things will automatically rebound, improve the door safety performance. 1. Track and hinge are made of high-quality galvanized steel plate with a thickness of 1.6mm~2.0mm, which is pressed and made with a special die. 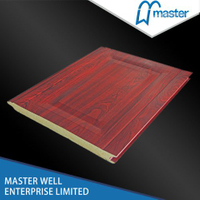 It has high strength, long service life and is resistant to corrosion for more than 20 years. 2. 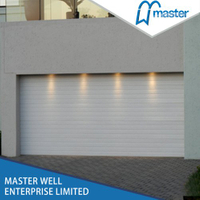 The roller is made of high strength and wear-resisting POM engineering plastics and embedded with ball bearing, so as to make the garage door run smoothly and smoothly with low noise, without hitting the wall, impact and unusual noises. 3. Balance system: the use of torsion spring balance system, service life can reach more than 100,000 times, each set of torsion spring according to the size and weight of the garage door to tailor, make the garage door motor always work under light load, to ensure the good operation of the garage door. 4. Sealing: the bottom adopts special aluminum alloy buckle slot and u-type rubber seal, and the side seal adopts PVC sealing strip, with good sealing performance and durability. 5. Hardware accessories: all hardware accessories are made of high-quality galvanized materials.